On December 8th we celebrated the feast of the Immaculate Conception and the Vatican ushered in the “Year of the Jubilee.” For the Italians, it was the start of a joyous Christmas season. The main focus for many Italians during this season is “il Presepe,” and many families dedicate hours to preparing the manger scene with figurines collected throughout the years, which bring a special and unique meaning of Christmas to each of them. St. Francis of Assisi is credited with the first nativity scene in 1223. It was his attempt to place the emphasis of Christmas upon the worship of Christ rather than secular materialism of gift giving. The scenes were live, usually by a cave, with a cast of people and animals from the area. Over the years, as the traditions spread throughout the Christian world, the use of figurines replaced the live characters. takes great pride and honor to do so. In the Avellino province the process of crafting the figurines is an all year round undertaking. Three years ago, I was in the area and I enjoyed watching the craftsmen repairing and modeling new figurines to be sent all over Italy. It was July and I was experiencing the Christmas spirit in the summer time. 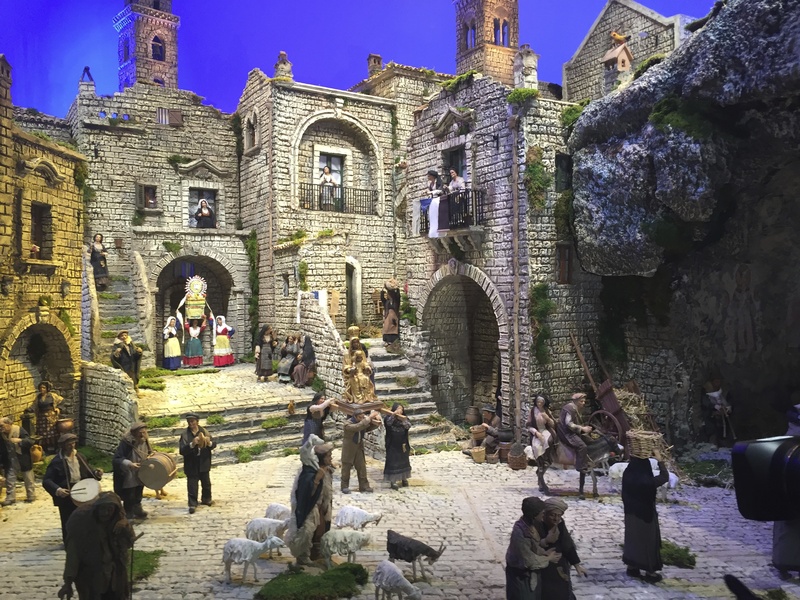 Francesco Artese, from Basilicata, designed a monumental set replicating the scenes of everyday life of the local and rural civilization that receives, in humility and simplicity, the Mystery of the Nativity. I was fortunate to be invited to attend the unveiling this Nativity scene, as it was presented to Cardinal Timothy Dolan at St. Patrick’s Cathedral, on December 7th. I encourage everyone coming to New York to visit St. Patrick’s Cathedral to admire this wonderful masterpiece. While at it, take time to appreciate the wonderful restoration the cathedral has undergone. Buone feste! Image | This entry was posted in Blog, Culture, History, Italian, Italian American, Italy, NIAF, Un Minuto con, Uncategorized and tagged Basilicata, Buon Natale, Christmas, Culture, Italia, Italian, Italian American, Italy, Manger Scene, Merry Christmas, Natale, Nativity, Nativity Scene, NIAF, Presepe, St. Francis of Assisi, St. Patrick's Cathedral, Tradition, Year of the Jubilee. Bookmark the permalink.